Following the release of the NRMA Safety Audit Report today, revealing almost 70 per cent of motorists break the speed limit in school zones, the Chairman of the PCA, Mr Harold Scruby, called on the NSW Govt to immediately install Fixed Speed Cameras and Flashing Orange Lights around all School Zones. Mr Scruby said: “We have been campaigning for over ten years to get 40 kmh zones around schools throughout Australia. It has been like extracting teeth (see attached article – SMH 9 March 1995). Although the NSW Government has now finally embraced this fundamental objective (and we congratulate them for it), the enforcement in these zones is virtually non-existent. And the NRMA figures today prove it and the axiom – ‘non-enforcement of laws encourages their disobedience’. “Children are our greatest asset. It is their fundamental right to have our best protection, particularly where they are most vulnerable. Speed cameras around all schools could be installed tomorrow. But the bureaucracies will argue about funding and continue to play “pass-the-parcel” with children’s lives. The answer is simple. Revenue from all speed and red-light cameras must go straight back into Road Safety. Treasury must stop grabbing these funds and then arguing there is no money. This in turn will allow more police back on the roads and footpaths, where they belong. And it will counter any arguments from the “revenue-raising” brigade. “Mr Scruby added: “It is also vital that solar-powered orange flashing light be installed at all these zones. They can be activated only during the times and days appropriate and warn every motorist they are entering these zones. Additionally, the times must be expanded to 7:00 AM to 5:00 PM, along with a widely publicised awareness campaign based on a slogan such as “7 to 5 … ENSURE THEY SURVIVE”. Children come and go to school throughout the day; to sport, to excursions, home sick, etc.. Furthermore, it is extremely difficult for motorists and pedestrians to remember the current times, or even know whether a private or public school day or they are on holidays. “Mr Scully’s suggestion that these zones are working is simply a result of good luck. It has nothing to do with good management and based on the NRMA’s study, we will surely see another Ella James tragedy unless he acts now,” Mr Scruby said. ALMOST 70 per cent of motorists break the speed limit in school zones, an exclusive NRMA safety audit has revealed. Research carried out by the NRMA at five NSW schools found that on average 65 per cent of drivers sped through 40km/h zones at the end of the school day, with some reaching speeds of up to 80km/h. The worst was at Miranda North Primary School in Sydney's south, where 90 per cent of motorists exceeded the speed limit as children tried to cross The Boulevarde. At Boronia Park Primary in Gladesville 60 per cent or drivers were clocked over the limit while at Blacktown South Primary 63 per cent of drivers ignored the speed limit. In Wollongong, 63 per cent of drivers sped past Fairy Meadow Demonstration School, while students at Newcastle's Mayfield East Public School were put at risk by 50 per cent of drivers. The findings have led to calls from road safety campaigners for permanent fixed speed cameras within the state's 2400 school zones and flashing signs warning motorists they are approaching a 40km/h area. "It is outrageous schools are not protected with fixed speed cameras because they would save lives and quickly pay for themselves," Pedestrian Council of Australia chairman Harold Scruby said. "If the revenue raised by the cameras was used to buy more cameras, not put into general revenue, we would quickly reduce this problem." The NRMA hired an independent firm to monitor five schools over four days. The speeds of 352,400 cars were measured. NRMA member services chief executive officer Rob Carter said the results showed most drivers were not obeying the law. "Driving even a few kilometres above the speed limit can mean the difference between life and death if a child runs out on to the road," Mr Carter said. "It's disappointing that 65 per cent of motorists on average are still failing to drive to the speed limit in 40km/h school zones." While drivers tended to be better behaved in the mornings, 50 per cent still broke the 40km/h barrier. NSW Roads and Transport Minister Carl Scully said the speed zones were working, with no children killed last year or this year. "Between 1999 and mid-2001 there has been a 41 per cent reduction in casualties in five to nine-year-olds," a spokesman for Mr Scully said. "During the same period there has also been a 31 per cent reduction in casualties for 10 to 14-year-olds." He said by the end of this year all NSW schools would have a school zone between 8am and 9.30pm and 2.30pm and 4pm as part of the $10 million Staysafe package announced last year. One of the best ideas in road safety for a long time was the move to declare 40km/h zones outside NSW schools. But while this is a laudable attempt to keep W our kids safe, the mechanics of how these speed zones work can be improved significantly. Under the current arrangements, drivers are required to drive at a maximum speed of 40km/h through the school zones. The speed zones are enforced on school days between 8am and 9.3Oam, and again between 2.3Opm and 4pm. Sounds simple enough. But simple or not, NSW drivers just aren’t getting the message. According to a new survey by the NRMA, in some areas more than 90 per cent of drivers are exceeding the 40km/h speed limit. Does this mean we are a bunch of callous leadfoots too focused on our own concerns to think about the safety of children crossing roads outside schools? There may be some truth to that. But it is also time for the Government to concede that the problem is more than just a case of reckless drivers. Quite simply, the current requirements are too onerous on drivers. The driver, in a split second, is expected to recognise he is in a school zone, check his watch to see if the speed zone is in force and then check his speed and decelerate if necessary. This is too much on Sydney’s busy roads. For a start, while the 40km/h signs are painted in big letters on the road, they are easy to miss for drivers already on the look-out for traffic lights, roundabouts, stop signs and so on. Pedestrian advocacy groups have called for flashing lights to be installed at schools to ensure drivers know where the zones are and when the zones are in force. There has also been a call for fixed speed-cameras to be set up in all school zones. But the Government might also want to consider what happens with school zones in the ACT in a bid to clear up driver confusion. In Canberra, the speed zones are in force between 8am and 4pm on school days, with no breaks in between. This is logical. Children are arriving at or leaving school throughout the day — to go home sick, for excursions and so on — so the slower speeds make sense for the full day. The school zones are a good idea, but one which needs to be revisited. The high rate of speeding through these zones shows they are not working very well at the moment. Let’s not wait until a child is run down and killed before the problems are addressed. Campaigners trying to protect the lives of children won a victory yesterday when a temporary speed limit was authorised outside a primary school. 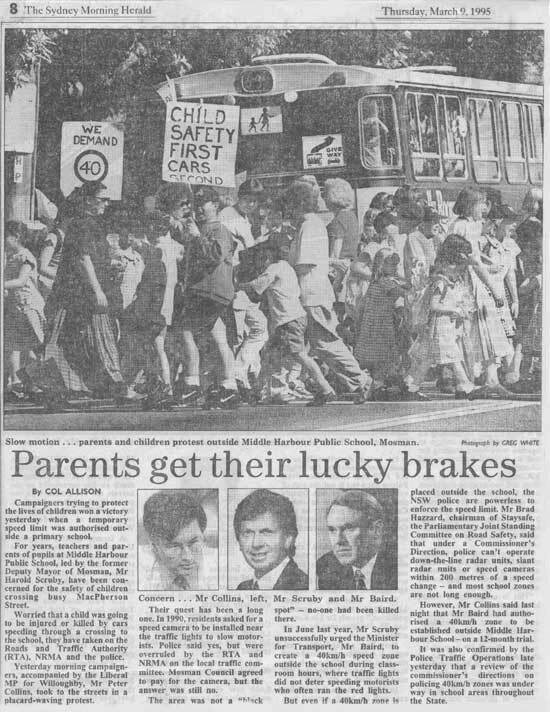 For years, teachers and parents of pupils at Middle Harbour Public School, led by the former Deputy Mayor of Mosman, Mr Harold Scruby, have been concerned for the safety of children crossing busy MacPherson Street. Worried that a child was going to be injured or killed by cars speeding through a crossing to the school, they have taken on the Roads and Traffic Authority (RTA), NRMA and the police. Yesterday morning campaigners, accompanied by the Liberal MP for Willoughby, Mr Peter Collins, took to the streets in a placard-waving protest. Their quest has been a long one. In 1990, residents asked for a speed camera to be installed near the traffic lights to slow motorists. Police said yes, but were overruled by the RTA and NRMA on the local traffic committee. Mosman Council agreed to pay for the camera, but the answer was still no. The area was not a “black spot” — no-one had been killed there. In June last year, Mr Scruby unsuccessfully urged the Minister for Transport, Mr Baird, to create a 40km/h speed zone outside the school during classroom hours, where traffic lights did not deter speeding motorists who often ran the red lights. But even if a 40km/h zone is placed outside the school, the NSW police are powerless to enforce the speed limit. Mr Brad Hazzard, chairman of Staysafe, the Parliamentary Joint Standing Committee on Road Safety, said that under a - Commissioner’s Direction, police can’t operate down-the-line radar units, slant radar units or speed cameras within 200 metres of a speed change — and most school zones are not long enough. However, Mr Collins said last night that Mr Baird had authorised a 40km/h zone to be established outside Middle Harbour School — on a 12-month trial. It was also confirmed by the Police Traffic Operations late yesterday that a review of the commissioner’s directions on policing 40km/h zones was under way in school areas throughout the State.